I love off the shoulder tops and they have been on trend this summer. There's so many different styles and I just love them all. (Hehe). 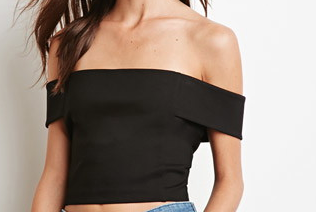 I came across this sweetheart cut off the shoulder top from Forever21. I was undecided on which color and just went with the trusted ol' black. I paired it with some skinny jeans for a nice relaxed summer look. These jeans by the way were 7 bucks! What a steal, right?! The finishing touches to the look were these gold oxford shoes and a red clutch. I've had this clutch for 4 years strong! Still can't believe how well it's held up for so long. On another note is it me or does anyone else feel like the summer is going by so fast?! My gosh we are already ending the second week of July. Slow down summer, Lol. Hope you guys been enjoying your summer so far! Hope you guys enjoyed this simple summer look. Thanks for stopping by! Have a awesome Fri-yah and weekend! !